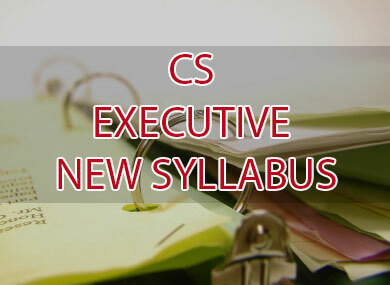 Here in this post, we are providing the CS Executive new syllabus details along with the CS executive subjects and their contents as per the ICSI Syllabus Notification for the company secretary course syllabus. In the previous posts, we wrote about cs course details see those details also. The subjects in CS Executive Course are divided into two modules and there are7 subjects. See Also – C.A Course Details, C.F.A Course Details, C.S Course Details. Expert Knowledge level is required. The objective of this is to acquire knowledge & understand the regulatory frameworks of the companies. Introduction, Incorporation and its Consequences, Financial Structure, Membership in a Company, Management and Control of Companies, Investments, Loans and Deposits, Accounts and Audit, Dividends, Registers, Forms and Returns, Inspection and Investigation, Majority Rule and Minority Rights, (Merger, Demerger, Amalgamation, Compromises and Arrangements – An Overview), Producer Companies, Limited Liability Partnerships, Application of Company Law to Different Sectors, Offences and Penalties, Compounding of Offences, Winding up of Companies, Striking Off Name of Companies, An Introduction to E-Governance and XBRL. To gain knowledge of the concepts, techniques and to practice cost & management accounting to develop decision-making skills. The objective of this paper is to understand economic & commercial laws. In this Par –A (70 Marks) For advanced knowledge and Part–B (30 Marks) For working knowledge. The objective is to acquire practical and procedural aspects to direct tax laws, service tax & vat. Visit www.icsi.edu for more details. Respected sir, Is there any recent amendments in cs executive group? if any,please send amendments list to my email address.